What Can Lean Do for You? “Anyone can be 100 percent efficient, if they set the standard low,” Sullivent said. As Director of Operations at the Tulsa plant, Sullivent applies the “Lean Enterprise Principles” to eliminate waste and improve the flow of production. “Velocity is the word I like to use. We need to be moving at a pace that focuses on more output,” he said. When Sullivent talks about greater output, it isn’t just about numbers. The “Lean” concept directly connects customers’ needs to production. Sullivent first introduced Lean Enterprise to the Tulsa facility in 2005, applying the concept to how the manufacturing division handled assembly and distribution. “We began to look at the value stream and started to work upstream to really take care of our customers and define what is really important to them. We needed to eliminate the waste that the customer doesn’t value,” he said. Although the management style shift produced immediate results, getting the entire team on board required an adjustment period. “It’s a complete change in culture when you introduce Lean Principles. A lot of people resist change. It can be a long journey,” Sullivent said. 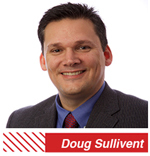 Sullivent found the strategy, which requires collaboration, made weak employees more apparent. “The first thing that pops up is who is a team player. If you don’t want to work in a team, you kind of vote yourself off the island,” he said. Under Lean, the plant streamlined its assemblage area. The team now does the same tasks in nearly half the amount of space. “We combined things and got rid of a lot of the redundancy. We are able to do more volume with fewer resources,” Sullivent said. The Lean philosophy has helped the facility evolve, according to Sullivent. “It never ends. It has to be continuous. You always should be looking for ways to improve,” he said. Although the principles can be tough to initiate, Sullivent has found the payout to be huge. “What has Lean done for us? It has helped us grow. Lean fuels the fire,” he said. Doug Sullivent is Director of Operations and Plant Manager at the Tulsa site. Sullivent, who has worked for the company for 10 years, was first drawn to Muncie Power Products because of the corporation’s stellar reputation both locally and in the hydraulics industry. He holds degrees from Southern Nazarene University and Oklahoma Wesleyan University. He previously worked as a supply chain manager at Gear Products and was plant manager at U.S. Marine, a division of Brunswick Corp.
© 2019 MUNCIE POWER PRODUCTS, INC.